Lego Minifigure Mayhem - RNIB - Supporting Blind and Partially Sighted People. Full of facts, jokes and activities, this special World Book Day book is perfect for young LEGO fans who are beginning to develop a love of reading. Find out about some of the coolest and silliest LEGO minifigure characters with simple, entertaining text and fun fact files. Discover the Chef's tastiest creations, laugh at the Clown's funniest jokes, and be inspired by creative LEGO play ideas and challenges. 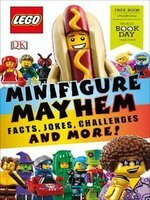 LEGO Minifigure Mayhem is packed with colourful images that will encourage even reluctant readers to read more about their favourite LEGO characters, and beyond.